Renaissance patrons wanted art that showed joy in human beauty and life’s pleasures. Renaissance art is more lifelike than in the art of the Middle Ages. Renaissance artists studied perspective, or the differences in the way things look when they are close to something or far away. The artists painted in a way that showed these differences. As a result, their paintings seem to have depth. An artist from Florence named Giotto was one of the first to paint in this new style. Giotto lived more than a century before the beginning of the Renaissance, but his paintings show real emotion. The bodies look solid, and the background of his paintings shows perspective. The art produced during the Renaissance would build upon Giotto’s style. Leonardo da Vinci was born in 1452 in the village of Vinci. His name means Leonardo of Vinci. Leonardo began his career working for a master painter in Florence. By 1478, Leonardo left his master and set up his own workshop. 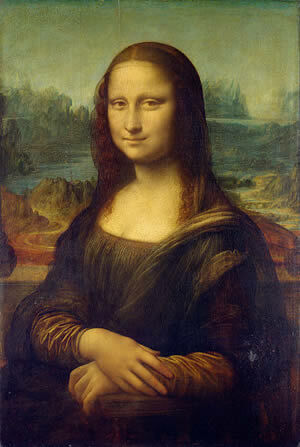 People have been trying to guess the secret behind the smile of his Mona Lisa ever since he painted it around 1505. His Last Supper shows clearly the different feelings of Jesus and his followers. Leonardo’s fame grew—but not just for his painting. Leonardo was truly a “Renaissance Man,” skilled in many fields. He was a scientist and an inventor as well as an artist. He made notes and drawings of everything he saw. Leonardo invented clever machines, and even designed imitation wings that he hoped would let a person fly like a bird. 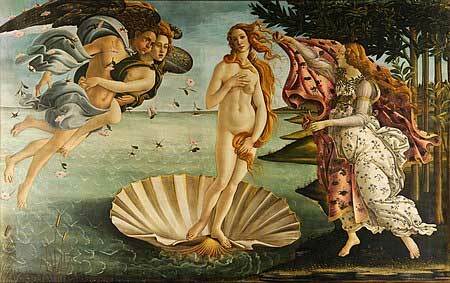 The Birth of Venus by Italian artist Sandro Botticelli (c. 1480s). The painting depicts the goddess Venus arriving at the shore after her birth, when she had emerged from the sea fully-grown. Michelangelo Buonarroti of Florence was one of the greatest artists of all time. Like Leonardo, Michelangelo was a “Renaissance Man” of many talents. He was a sculptor, a painter, and an architect. 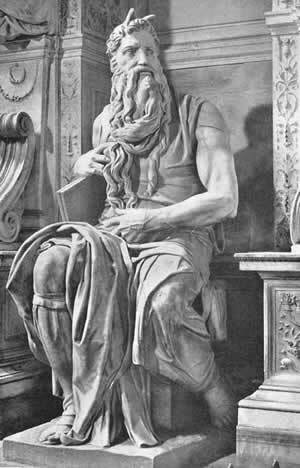 When Michelangelo carved a statue of Moses, he included veins and muscles in the arms and legs. Michelangelo was a devout Christian, and the church was his greatest patron. He designed the dome of St. Peter’s church in Rome. Nearby, Michelangelo’s paintings cover the ceiling of the Sistine Chapel, the building where new popes have been selected for more than five hundred years. Michelangelo’s painting illustrates the Book of Genesis, with scenes that span from the Creation to the Flood. The project was very difficult. Working alone, Michelangelo had to lie on his back atop high scaffolding while he painted the vast ceiling. The ceiling of the Sistine Chapel is one of the world’s most famous paintings, but not everyone was happy with Michelangelo’s work. Cardinal Biagio de Cesena noted that the crowd of more than 300 human figures would be more appropriate in a wine shop than in a papal chapel. 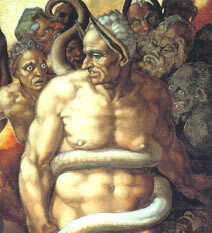 Michelangelo responded to this criticism by adding a portrait of Biagio (below) among the figures of the damned in the scene of the Last Judgment. 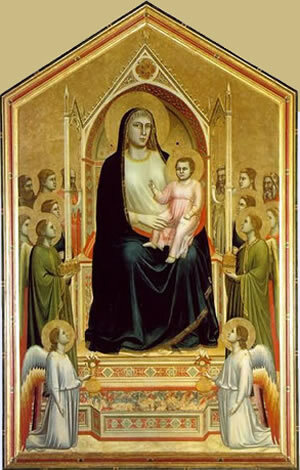 Madonna Enthroned (c. 1310), by the Italian artist Giotto di Bondone is often described as the first painting of the Renaissance due to its naturalism. Giotto was among the first artists to depict three-dimensional figures in western European art. 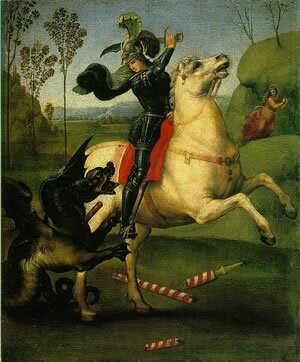 St. George and the Dragon by Raphael (c. 1504) The painting is currently housed at Louvre in Paris.